eileenaking – Computer Science is for Everyone! The Prodigal Blogger Returns…With a Big Announcement! It has been far, far too long since I actually managed to get something posted. Last November, I tried to challenge myself to post every day…and didn’t make it. Then, in December, I thought I could rally by posting something every day of Computer Science Education Week…and failed there too (although, no doubt, news of Prime Minister Cameron and President Obama‘s participation in an Hour of Code crossed your path without my interference). Since then, I’ve been caught up in a deluge of new adventures, all of which will be expounded on at length in due time: I’m now teaching three after-school classes a week through Minneapolis Community Education and mentoring an assortment of high school students as they embark on the Technovation Challenge, as well as working on a couple of independent projects. Most excitingly, though, I am beyond thrilled to finally be able to announce that plans are well underway for bringing a CoderDojo chapter to Northfield! 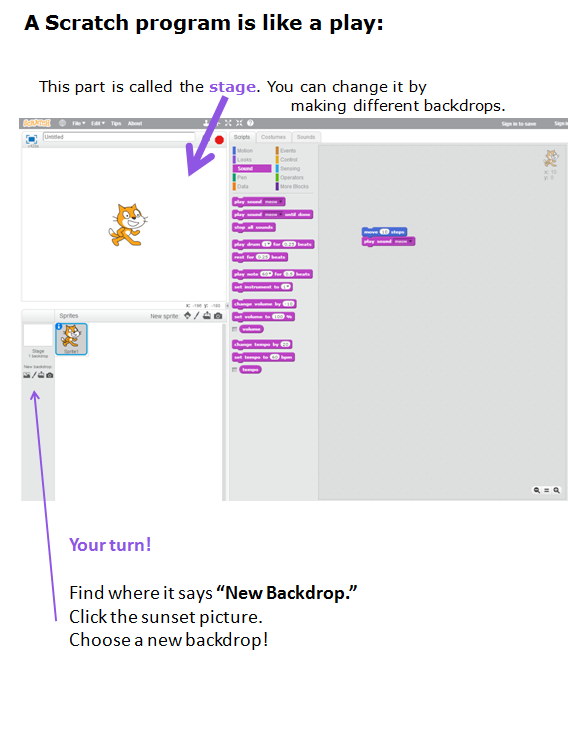 Given students’ enthusiastic responses to a summer math/computing camp and this past December’s Hour of Code, we expect this 1:1-iPad district to have no trouble filling a room with kids eager to learn to create and not just consume software, and ACM chapters at both colleges will help supply mentors. I could not be more proud to be bringing this to the town of my alma mater, sharing what I’ve learned with the community in which I learned it, and am blown away by the number of things that have come together already. Stay tuned as we finalize details and nail down a date for our first event! New Hour of Code Tutorial: Frozen! I got an email this morning from code.org, unveiling their new Hour of Code tutorial: making snowflakes with Elsa and Anna of Arendelle! I was thrilled to see that this event has gained enough traction for Disney to take notice and to use their characters’ outrageous popularity to further something so important (…as opposed to what Mattel’s been up to). I dove right in to testing it! Overall, I think it’s a great idea and pretty well designed. I thought it made loops very comprehensible; the jump to nesting them was perhaps sudden but certainly not as scary as it was in my early Java days. I really appreciated being able to speed up the animation and to stop the results as soon as you realize they’re wrong. I’m also pleased to see a totally non-violent introductory tutorial, something to create that doesn’t involve breaking/shooting/killing/blowing up/destroying/fighting anything at all (last year’s favorites included Plants vs. Zombies and Angry Birds themes, which are both fairly innocuous but still about one group fighting another). It’s showing participants that not only is programming something they can do, but that it has uses other than games. I’m totally into that. One thing I wonder about is the age of prospective participants. Based on watching students’ conversations, observing Halloween costumes, and anecdotes from my sister the professional Elsa impersonator (no, really), it’s looking to me like most of the kids who are still really into it are too young to have learned anything about the measure of angles. Will they get discouraged and be put off of things that look like block-based coding? Will they figure it out through trial and error and authentically learn both computing and geometric concepts? Will they just use brute force to try all the possibilities from the drop-down lists? When I worked with middle school students this summer on drawing parallelograms in Scratch, there was a lot of confusion about “turn __ degrees” versus the known interior angles of the shapes, but maybe that won’t be an issue for kids who haven’t yet learned anything else to get mixed up about. Anyone else who’s tried this (particularly with actual kids), I’d love to hear your thoughts! Yesterday’s post talked about some programmer training for people who need to find new careers for a variety of reasons. Up next, perhaps, people who are ready to be retired but need to keep their minds working or be empowered to create things? At the coffee shop where I work, a regular customer – a photographer of advancing years who just got his first smartphone – routinely chats with me about how he wishes he could have learned to code while he was recovering from surgery a couple of years ago. He thinks it would be incredible to be teaching actual programming, not just how-to-turn-on-your-new-Mac, in retirement communities, rehabilitation centers, and nursing homes. I’m with him – couldn’t Scratch be powerful not just for people who are too young to have learned to type but for people whose fingers are no longer dexterous enough? I’d like to try an Hour of Code with people who feel like the world no longer has time for them.